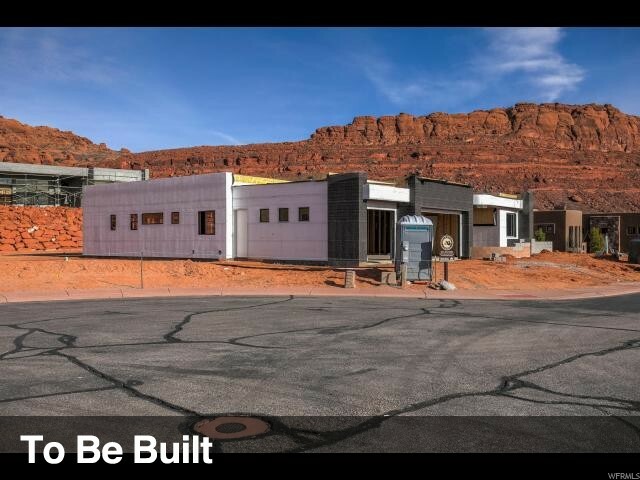 All St. George homes currently listed for sale in St. George as of 04/23/2019 are shown below. You can change the search criteria at any time by pressing the 'Change Search' button below. "Luxury & comfort describe this perfect home for family gatherings, entertaining guests & outdoor living. Beautifully situated to capture the magnificent views, packed full of features and amenities. The oversized kitchen with wolf/sub-zero appliances flows into the great room and dining area. Theatre with wet bar and safe room on the lower level. A steam room for relaxing after a fun day spent in the pool and putting green. World class energy efficient geothermal system, hybrid/foam insulation, 100% LED lighting, high efficiency humidification system, smart wiring, low VOC paints, bamboo and natural stone floors all create a home that is state of the art and easy to care for. " "This gorgeous home is situated to take in 360 degree views. Recently remodeled, this home has beautiful appointments throughout such as Travertine floors, gorgeous solid wood hand carved doors, theater room, second kitchen, outdoor bbq, custom pool (new equipment), backs to common area so very private, a roof top observatory with unobstructed views of Snow Canyon." "Find relaxation and tranquility within this beautiful home. Destination, Stone Cliff's unique 'Lifestyle' experience, embraces all the family. Hike, cycle, golf, Air balloon, photography. Enjoy the National Parks with Zion in close proximity, Ski Resort a short drive. Or, take in the 'artists' Mountain Views from your own balconies. Weather affords such a beautiful lifestyle here." "Beautiful home that sits on 1 acre. This house was the top house in the 2016 St. George Home show. It made the cover on the 2017 home show magazine, so its a very well known house. 1 Story, high 18 foot ceilings built in a timeless mid century style that will never age and always stay current and sought after. It is built with very high quality, coverings are done with glass, tile, cabinets and stacked stone. Doors are solid wood. Square footage figures are provided as a courtesy estimate only. Buyer is advised to obtain an independent measurement." 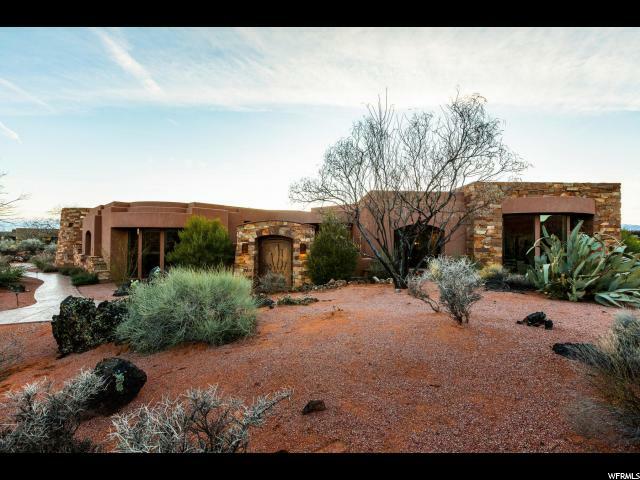 "Elevated on one of Entrada's premier lots, this 1.24 acre homesite offers panoramic views & quiet seclusion. Spacious floor plan, designer kitchen, Sub-Zero & Thermador appliances, 4 bedrooms including detached casita, 4.5 baths, 2 dens, 4 fireplaces, home theater, whole house audio with Control 4, 2nd kitchen in basement, waterfall, & resort-style backyard, gorgeous pool, hot tub, & putting green. Please call for more info. Entrada Country Club Associate Membership of $152/mo is required, allowing access to Country Club amenities (pools, spa, sports center & fitness center, etc). Required food minimum is $800 per year." 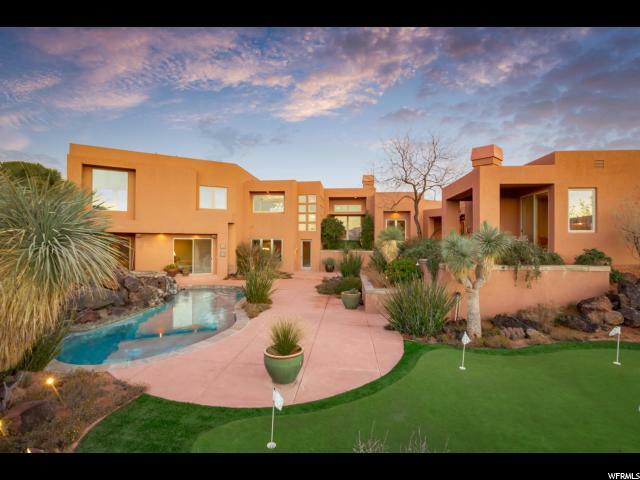 " Luxurious pool estate with a tranquil ''Zen'' attributes nestled next to the majestic, crimson cliffs of Snow Canyon and Tortoise Reserve! 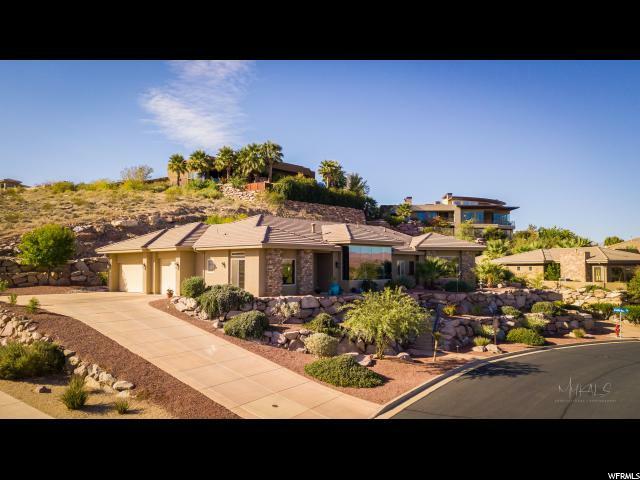 Located in the gated community of The Cliffs of Snow Canyon subdivision, this property will take your breath away! Every detail was meticulously thought-out and executed impeccably floor to ceiling. The exquisite exterior and interior architecture complement the natural surrounding landscape. Welcome to your own private oasis complete with 3 zone HVAC, smart-wired through-out; Control 4 System; Wolf and Subzero kitchen appliances; colorful handmade glass tile accents; custom decorative gates, sconces, and towel bars; self-cleaning pool with solar heat-exchange panels for supplemental pool heating, waterslide, fountains, swim step, and grotto with water fall; backyard firepit; outside private pool shower off the master bath room with decorative stone and art work; fireplaces in master bedroom and living room; front patio with fireplace and water feature; extra deep and extra wide attached garage with copious amounts of storage, and so much more. Yes, your dreams have come true! You're welcome! Community - Well-funded operating and reserve accounts - Low monthly fees which include landscaping outside the privacy wall - Membership in Entrada Country Club is not mandatory - Access via golf cart to Entrada County Club - Access to the Turtle Preserve Trails via the Kesfler Trail Landscaping - Custom decorative gates and sconces - Fire pit - Front patio with Fireplace and Fountain - Smart Controller for plant irrigation - Mature trees and bushes Backyard - Self-cleaning salt-water pool with spa, waterfall, and fountains - Patio with ventilation fan and speakers - Outdoor pool shower with privacy - Bathroom access - Cooking area with BBQ and rotisserie, fridge, and sink Mechanical - Three-zone HVAC - On-demand gas water heaters - Solar heat-exchange panels for pool heating - Smart-wired house throughout - C"
"This gorgeous home is perfect for your fussiest buyer! 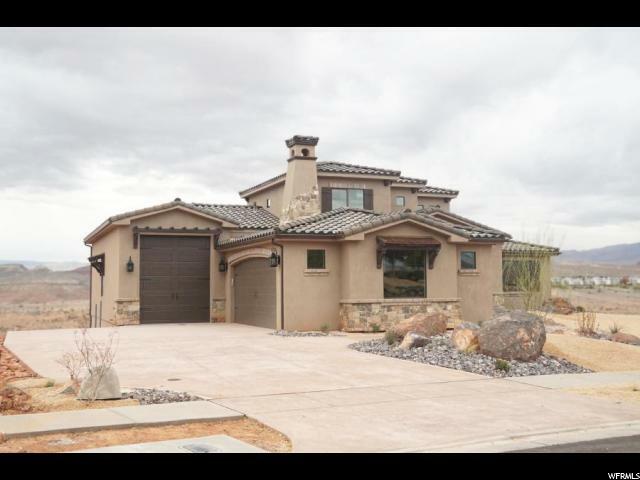 Snow Canyon vistas & 1300 sf of covered patio w/outdoor kitchen & fireplace. 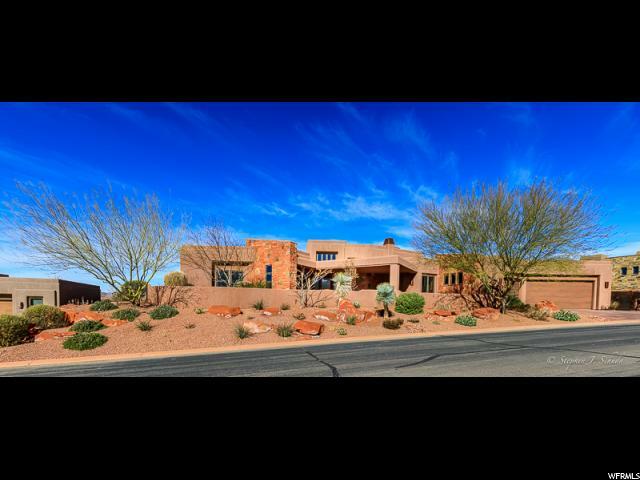 An entertainers delight w/Chef's kitchen, formal & kitchen dining, 3 Fireplaces, separate Casita w/liv rm. Dual Exec Office & Craft Rm which could be 4th Bedroom! Garage workshop. Coffered ceilings with elegant crown molding throughout. 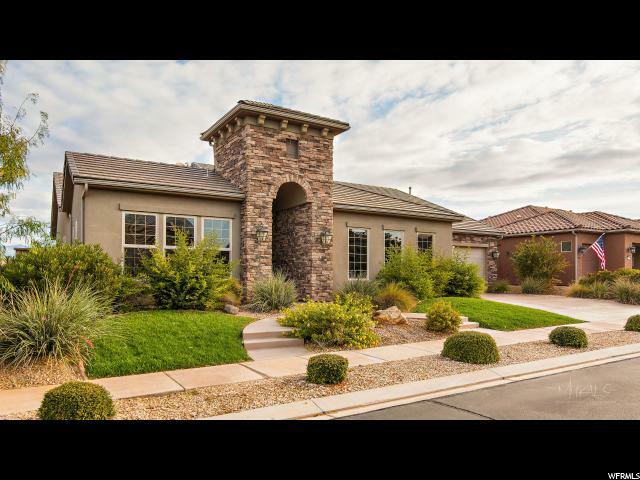 Live the Entrada lifestyle in this elegant home. Agent will meet for private showing." 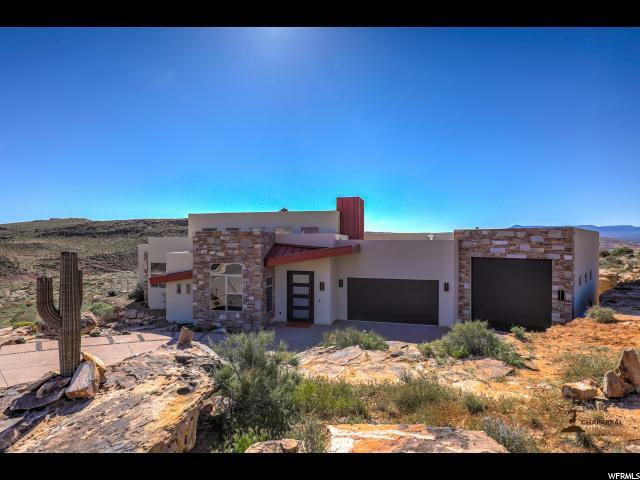 " MAGNIFICENT MASTERPIECE featuring VIEWS of Pine Mtn,St George City & Surrounding Valley! Located in a Secluded Cul-De-Sac..12 & 10 foot Ceilings,Supersized View Windows,Hardwood Doors & Trim,CUSTOM POOL & SPA,Huge Covered Patio w/Built in BBQ,Gas Fire pit,ENERGY EFFICIENT heating/cooling. 2nd Master Suite,Attached Guest Suite, Huge Oversized 4 Car Garage! Expertise in Design & Craftsmanship." "Amazing Custom Home we fondly refer to as the ''Cloud'' House! This home changes with the daylight. Spectacular Views, No HOA's and Supreme Privacy! This property is an Entertainers Dream. Fantastic, FUN indoor living, with truly Spectacular outdoor living as you enjoy the pool/spa while watching the birds/wildlife... Simply a Joy to Experience! Turn-Key and Truly One-of-a-Kind! 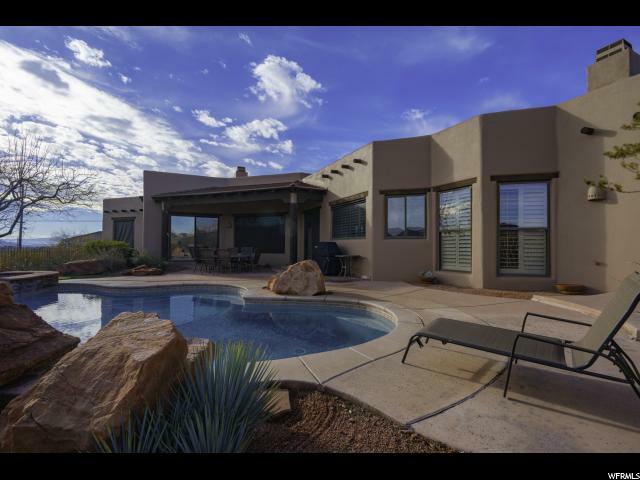 Owner/Agent"
"Located in Entrada this beautiful 2005 Parade home features an open living plan, gourmet kitchen, pool/hot tub, large covered patio, several fireplaces, Wolf Appliances, views of the golf course. 2 story home w/ elevator to upstairs living. Master suite has a huge walk-closet with custom built-ins, steam shower, jetted tub and heated towel rack. Guest quarters w/bath & kitchenette. Exterior painted in 2019. Plenty of room to spread out with family and friends." 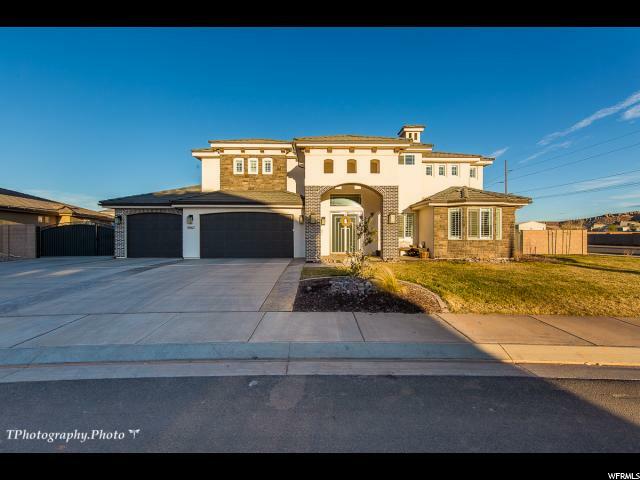 "You could be the owner of this beautiful 1997 Parade of Homes! Spectacular views! Perched near the 13 hole of Entrada's golf course. You will enjoy the pool and patio area to relax and watch the mountains light up in the evening. Superb one- level living at its finest." "Custom new build, high-end home located in desirable subdivision The Village of Little Valley. The home is within short walking distance to pickleball, public parks, Elementary School, Intermediate School and more. High end finishes found throughout with intricate custom cabinetry & finish work. Vaulted ceilings, wood floors, and huge backyard. Detached flex/bonus room that can double as boat/RV garage. Under Construction." 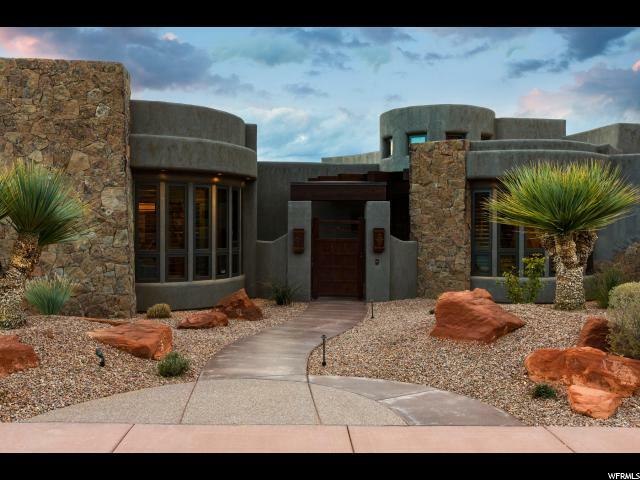 " The most spectacular views you've ever seen of St. George and surrounding area. Built on the most premier .41 lot on Foremaster, you'll love this upgraded home with its 7 bedrooms, WOLF appliances and professional kitchen, tons of living and entertainment spaces, home theatre, and massive back yard and deck to enjoy the views, with more than enough room for a pool. This home is built for entertaining and offers premium, thick cut granite, 20'+ entry way and living room, polished travertine, tons of storage, plantation shutters, solid wood doors, 2nd kitchen / entertainment bar, game rooms, tons of windows to enjoy the views, panic/safe room with phone hookups, and an unfinished vault and bedroom that could be used as shop (not one of the 7 bedrooms). Take in the million dollar 180+ degree views of Snow Canyon, St. George City, Virgin River, Dixie Rock, the temple, and the best 4th of July Firework show you'll ever see. You'll be blown away with it's professional office and custom built ins, and the massive master closet with custom racks and storage. Just minutes from the hospital and multiple golf courses. Centrally located and on a quiet road, and still just up the street from the central hub of St. George with shopping and stores. Less than an hour from Zion National Park, and 2 hours from Las Vegas. Buyer to verify all information, deemed reliable, however buyer to verify all info including utilities & HOA information if applicable." " WOW! Best 1/2 acre unbelievable view lot in Washington County! Custom top-quality finishes, box beams in kitchen with up lighted crown molding. Granite counters and plank tile flooring. 2 sided fireplace.5 car/RV garage.Basement designed for independent/mother in law quarters. 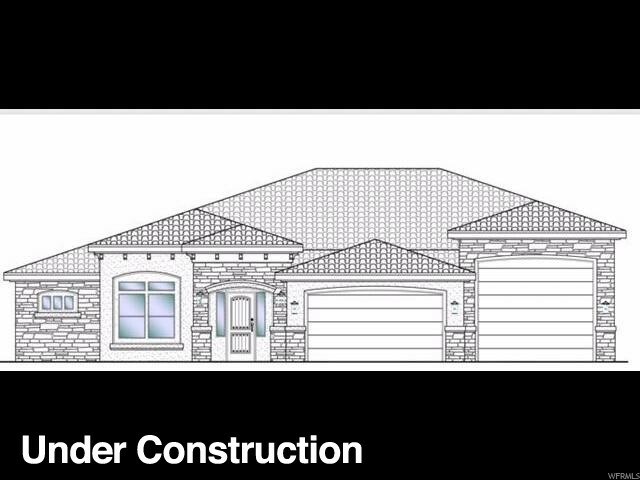 With private 2 car garage.Framed for 2 bedrooms, a bathroom, Theater Room and plumbed for 2nd kitchen." 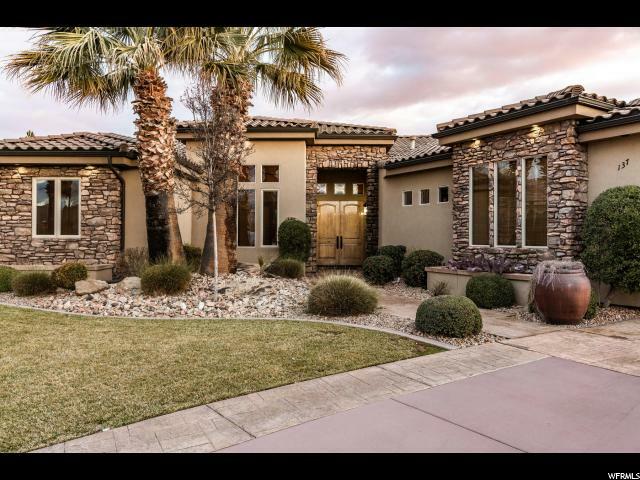 "This stunning home is located in the gated/guarded community of Stone Cliff Estates. The home is perched high on the mountain to take in the spectacular views of Pine Valley Mountain with the twinkling city lights below. 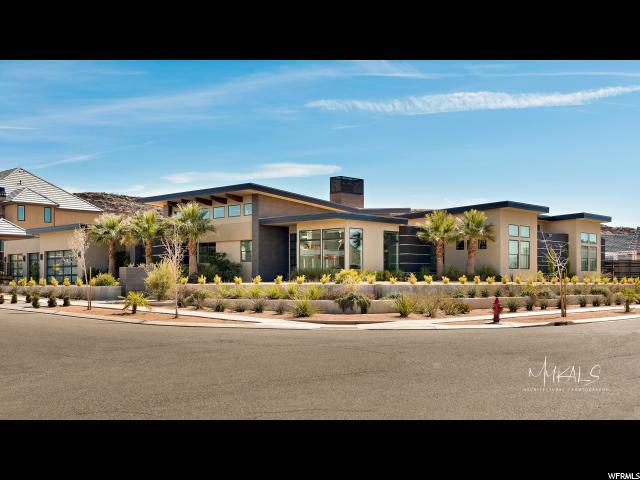 Recently remodeled, this home showcases the beautiful craftsmanship such as the built in cabinetry, gourmet kitchen, and the floor plan being exceptional and well throughout. " "Located behind the gates of The Ledges, this gorgeous home offers great views & plenty of room for a pool. 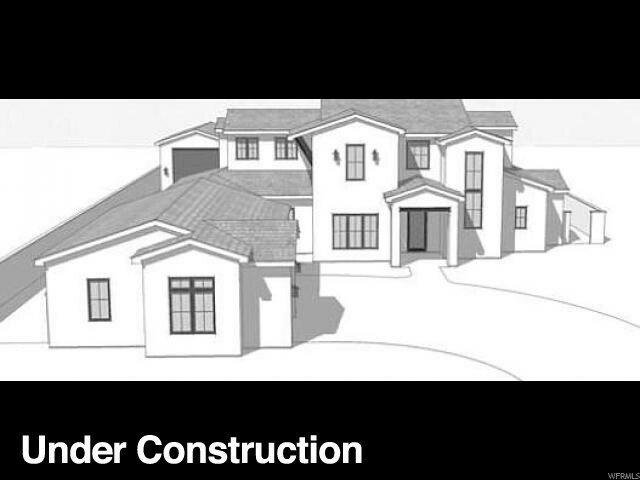 Bright, open floor plan, 4 bedrooms, 4.5 baths, office, designer kitchen, wood floors and quality finishes. Large .41 acre lot with 4 car garage, ideal location near golf, hiking, and endless recreation opportunities. Completion around the end of April." 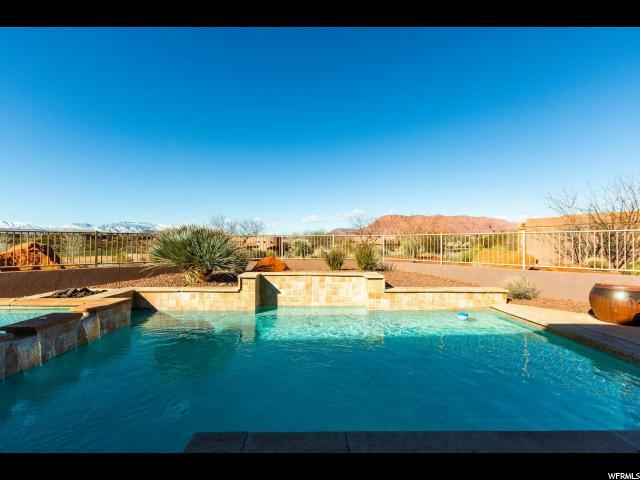 "Located behind the gates at The Cliffs of Snow Canyon, this gorgeous home offers great views & plenty of room for a pool. 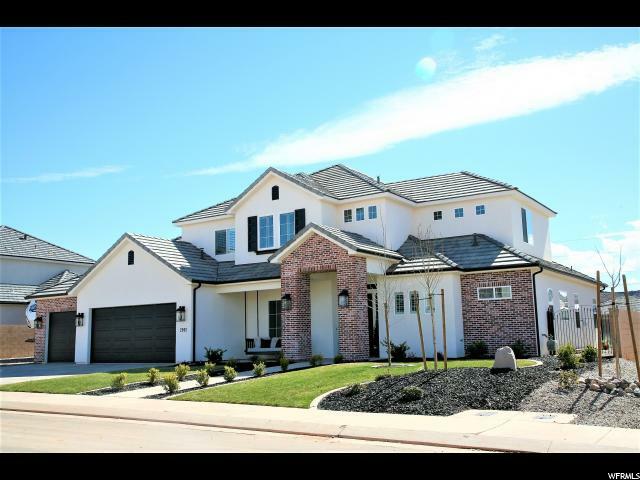 Bright, open floor plan, 4 bedrooms, 3.5 baths, office, designer kitchen, wood floors and quality finishes. Large .33 acre lot with 3 car garage, ideal location near golf, hiking, and endless recreation opportunities. Completion around the end of April." "Price includes front and east side to south east corner landscaping. Double Ovens. Buyer to verify all information." 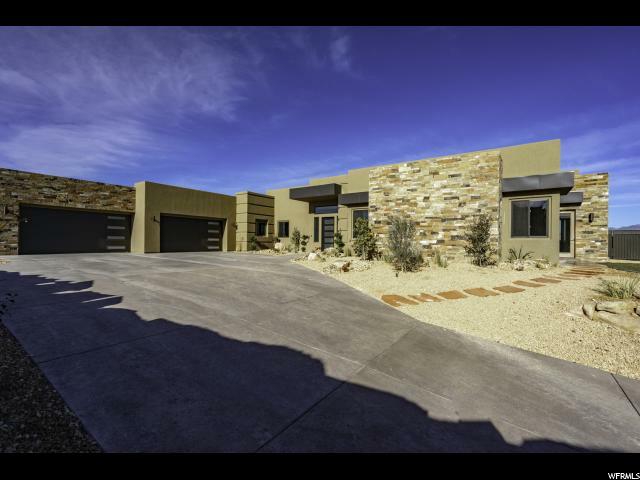 "High-end custom finishes and details throughout, 4 bedrooms, 3 bathrooms, 4400 sf + on one level, 3 car garage, 1200 sf+, gated RV parking, Grand Master Bedroom and Bath, Custom Gourmet Kitchen, 2 fireplaces, Den/Office, Exercise room, 12ft + ceilings, Spacious 3-room Casita with secluded yard, Luxurious Pool and spa and Outdoor kitchen." "This immaculate home is a must see! 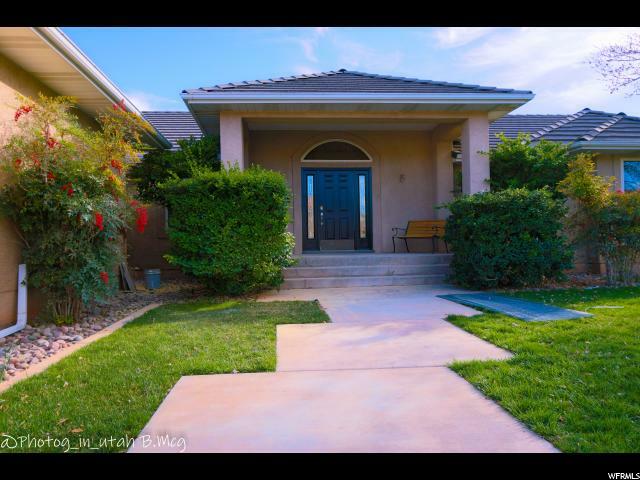 Open floor plan with 5 spacious bedrooms, 4.5 baths, plus a office/den room off entry. Main level master suite is incredible with the shower large enough for the whole family! Great for summer time with a splash pad/waterfall right in your own backyard. Hot tub for the cool winter nights. RV parking. Fully fenced yard. Water softener included." 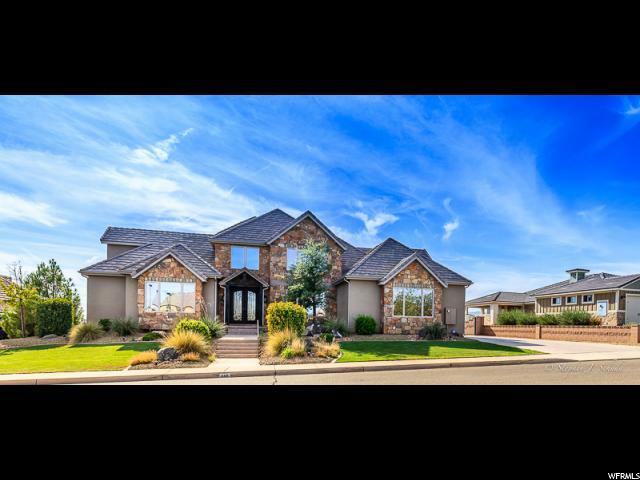 "Amazing former model home in SunRiver, Backs to golf course with wide open views. 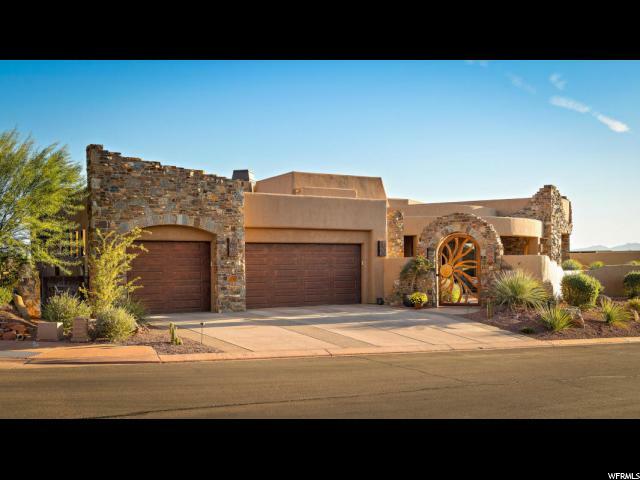 Home has a Casita and a three car garage with single car finished as an entertainers area. (Buyer willing to restore to a garage if desired). Two private patios. A foyer with a sitting area Custom finishes throughout including wood work, tile, Huge kitchen. Immediate Move in with furnishings being offered for sale. " "This beautiful French Country home is in the Popular Arbors Subdivision is the one you have been looking for! 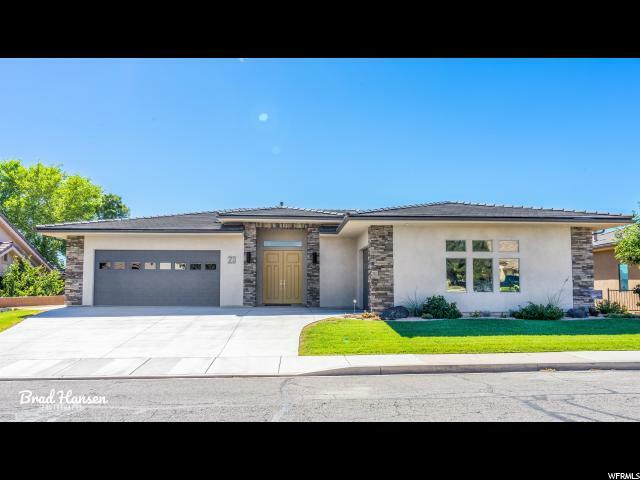 This home is full of upgrades and high quality finishes, custom cabinets, quartz counter tops, upgraded appliance package, upgraded carpet and pad, upgraded flooring and light fixtures. The Kitchen has a double oven, Fridge Freezer side by side, Custom cabinets with soft close drawers (throughout whole house), Extra Large Pantry...truly a chef/bakers kitchen! All walls have white 2 tone paint. The Windows are encased and large, adorned with plantation shutters and bring in tons of natural light. The home has two water heaters with water softener and a recirculating pump, so you never have to wait for hot water! Two air conditioning units, each floor is separately temperature controlled. Central Vac, dimmers for lighting and fans, two laundry rooms, four bedrooms upstairs are Jack and Jill's with an extra sink in one of them. Real wood floors, gas fireplace, rooms are open and large. Master Suite feels like a vacation get-away! Master Suite is on the main floor with a re-claimed custom barn door into the master bathroom. Upstairs black out window coverings are in the TV/Theater/Game room. The home is wired for surround sound. An over-sized custom swing on the front porch is great for naps, reading or just relaxing. In the large backyard you will find a wonderful place for entertaining! A outdoor dining area, fire pit with lighting (light switch by fire pit), a French flower garden...with sitting area, or easy access for planting, can also be used for a vegetable or fruit garden. Backyard is fully fenced, open only on the left side of the home for RV parking...with Electric hookups. This home is perfect for a growing/starting out family, or for a retired couple, that can welcome family back home with tons of room! Plenty of room in the back yard to add a POOL! A must see! Home buyers must be qualified for cost of home. " " Gorgeous home with a breathtaking view of the golf course. 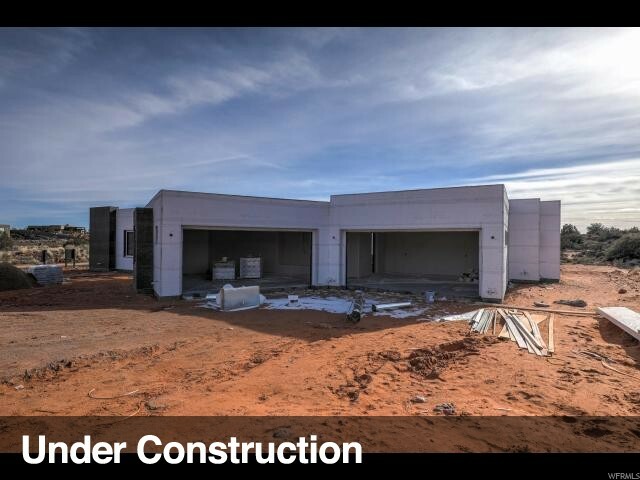 Currently mid-renovation, at completion this home will have all new cabinetry, complete new bathrooms, flooring (wood and tile), new fixtures, and more! Amazing wealth of natural light paired with the high ceilings add accent to the spacious layout. Large backyard with an in ground pool makes for the perfect summer getaway! Check it out!" "Custom in every way, handicap friendly, contemporary and clean lines. Incredible city and mountain views. No HOA, close to everything. 10 minutes to six Golf Courses, 3 minutes to hospital. Wood tile, huge great room, 3'' granite, Subzero type fridge, all LED lighting, 10' main ceilings and 9' in basement. 24' glass windows, greige paint, barn doors, modern ceiling fans, low E/tinted windows and and bidet. MONSTER kitchen pantry, walnut and white cabinets. Accent lighting, double master suites, floating vanities, all walk in closets, no shower doors to clean and balcony gas fireplace. Home was Completed March of 2016. Buyer to verify all information, deemed reliable, however buyer to verify all info including utilities & HOA information if applicable."